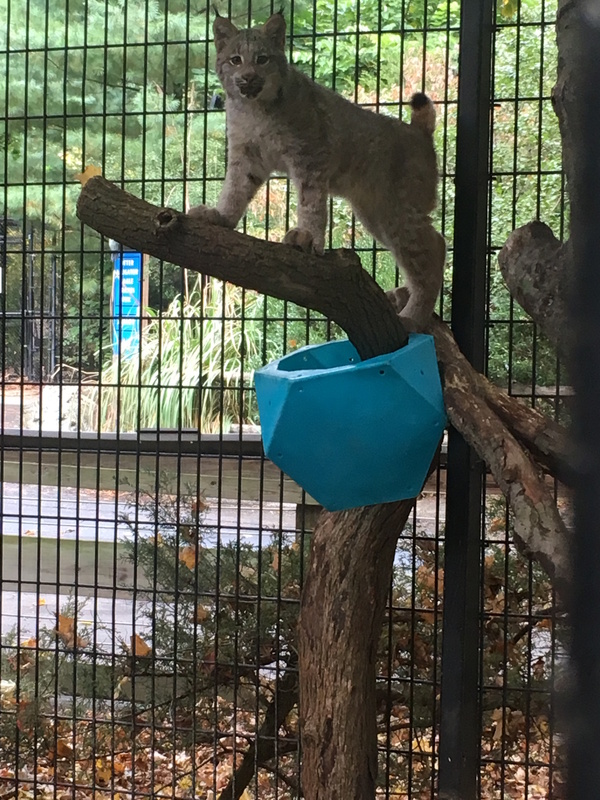 Connecticut’s Beardsley Zoo will say goodbye soon to its two Canada Lynx kittens, Ruby and Penny, as they will move in the next several weeks to their permanent home at the Buffalo Zoo. Born on April 26, 2017, the six-month-old kittens are part of the Association of Zoos and Aquariums (AZA) Species Survival Plan (SSP) program, which is designed to help ensure the survival of selected species, most of which are threatened or endangered in the wild. The Zoo announced the birth of the kittens on Endangered Species Day to emphasize the critical role of today’s accredited zoos in conservation programs. There is an SSP program in place for each family of animals through oversight by a group called the Taxon Advisory Group (TAG). The Felid (or Cat Family) Taxon Advisory Group makes breeding recommendations for big cats in zoos across the country, based on genetics, age and health of animals, and need for more of the species to protect future populations. Connecticut’s Beardsley Zoo’s Deputy Director, Don Goff, is the Chairman of the National Felid TAG group. He leads a committee of AZA-accredited Zoo members whose goal is to save declining species through carefully researched breeding recommendations. “We invite you to come see the kittens before they go,” he said. Connecticut’s Beardsley Zoo has had repeated success in breeding endangered species, a testament to the Zoo’s animal care team and the high quality of animal care. Over the past decade, the Zoo has been the birthplace of tiger and wolf cubs, otter pups, piglets, and more. The Lynx kittens’ parents will remain at the Zoo. Lynx are light brown to gray in color, similar in appearance to a Bobcat but larger, with longer legs. The tip of their tail is black, and they have long black ear tufts, giving them their distinctive appearance. Lynx lead a solitary life except during breeding season and when mothers travel with their young. Females give birth to between one-five young after a 60-74 day gestation period. Called either cubs or kittens, the young are weaned in two-five months. Lynx kittens learn to actively hunt snowshoe hares, red squirrels, and grouse by the time they are eight months old. Adult lynx are exceptional stalkers, silently ambushing prey once in striking distance. Can You ‘Spot’ the Black Leopard?